While setting down in my new office, I have been surviving on paper cups. So I decided to go to the nearest supermarket to shop for a mug and voila. 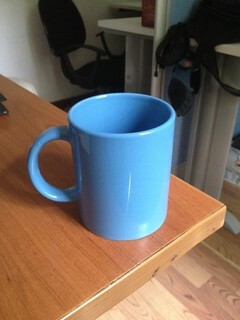 I pick this nice little blue one for a princely sum of RMB 6.60 which is about SGD 1.30. Not wanting to pay extra for the plastic bag to hold this mug, I decided to take it home as is. I got curious stares from people with me walking on the street holding a mug. With that sitting pretty on the desk, I'd be waiting for my french press to arrive via Taobao. That's RMB 35.00 which is about SGD 7.00.